On arrival at Kathmandu airport, you will be met by our representative and transferred to your hotel. Overnight. After breakfast, enjoy a half day tour of Pashupatinath and Boudhnath Temples. Pashupatinath: 6 km from Kathmandu city, on the banks of the famous Bagmati River is one of the holiest Hindu temples dedicated to Lord Shiva. The temple is built in pagoda style, has a gilded roof and richly carved doors. Entrance to non – Hindus is strictly forbidden. 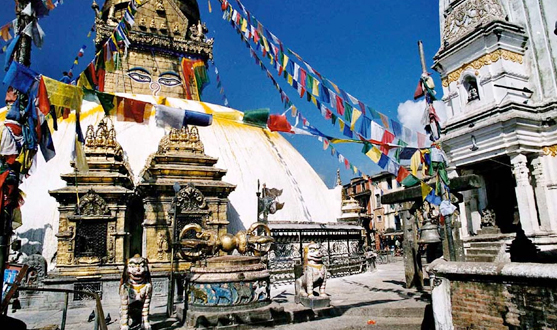 Boudhnath: This stupa is 11km from Kathmandu city and is one of the biggest of its kind. It was built by King Man Deva on an octagonal base inset with prayer wheels. Visit Patan one of the major cities of Nepal located in the south-central part of Kathmandu Valley. Patan is also known as Manigal. It is best known for its rich cultural heritage, particularly its tradition of arts and crafts. It is called city of festival and feast, fine ancient art, making of metallic and stone carving statue. Return to hotel. Overnight. After breakfast proceed to Nagarkot (2 hrs) at a height of 2,900 meters above sea-level to enjoy a beautiful sunrise and a view of the Kathmandu valley. Ganesh Himal, Gauri Shanker and Everest can be seen from here. Visitors can extend their sojourn to explore the country side. Overnight. Breakfast. Drive to Pokhara (7 hrs) enjoying the scenery along the hilly riverside road. Arrive and check in at your hotel. Go boating on Phewa Lake. Overnight. Breakfast. Enjoy a half day sightseeing tour of Pohkara. 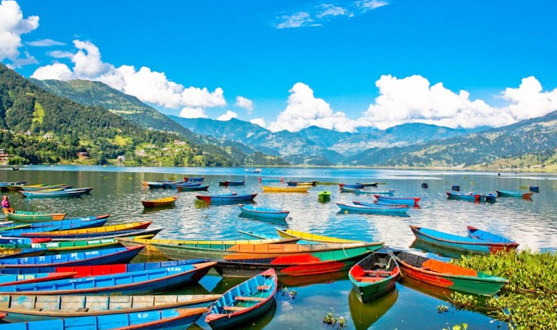 The winning combination of snow-clad peaks and snow fed lakes and rivers make Pokhara one of the most picturesque natural attractions in the Nepal. It the only city in the world from where the Great Himalayan Peaks can be admired from such a close distance. Also visit the Bindhyavasani Temple and Phewa Lake. Overnight. After breakfast, drive to Chitwan (4 hrs) on a scenic route. En-route visit Manakamana, take a cable car ride for a spectacular view of the mountains. On arrival at the resort, a naturalist will brief you about the wildlife programs and the lodge /camp facilities. 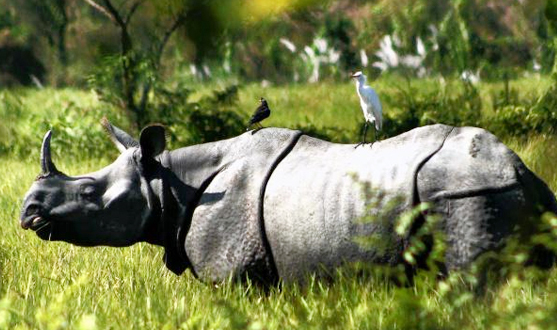 The Royal National Chitwan National Park is famous for its variety of wildlife, especially the Great Indian One Horned Rhino and the elusive Royal Bengal Tiger. Overnight. Breakfast. Enjoy jungle activities all day as per the lodge program - an excellent opportunity for bird watching and chances to see a variety of animals like deer, wild boar, rhinoceros, monkey, sloth bear, gaur and more. Overnight. After breakfast, drive to Kathmandu (6 hrs) admiring the dramatic scenery along the way as the highway follows a series of deep river valleys, villages and cascading rice terraces. Arrive and check in at your hotel. Rest of the day free to explore or shop on your own. Overnight. Package Price: Rs. 29,950 per person on double sharing basis. Accommodation in above mentioned or similar. All transfers and sightseeing ex Kathmandu as per itinerary by private AC car (Tata Indigo / similar). Vehicle is strictly as per itinerary and not at disposal. Daily buffet breakfast at all hotels in Kathmandu / Nagarkot / Pokhara and all meals in Chitwan. Entrance fee to the monuments. Meals other than those included in the package. Deviation from the tour itinerary. All hotels are subject to availability. In case fresh taxes are levied by the Government, the additional cost will have to be paid. Prices valid for those residing in India. NRIs / Overseas guests are requested to contact us.